If you want to know how to learn English, think for a moment about what you want to achieve. Do you want to be able to communicate with English speakers and not worry about accuracy? Do you want to know correct English grammar so you can pass an exam? Do you want to be able to use English at work? There are also other reasons you may be learning English, and your goal will be different depending on your reasons. If you want to learn English to be able to communicate, possibly when you are traveling, then to be honest with you, you don't need to worry too much about having perfect grammar. As long as you can understand other people and be understood by them then this will be enough. If this is what you want, then there are several ways you can learn. A self study book and CD pack, computer program or website can be really useful, as long as you have the self-discipline to study. Listen to as much English as possible, and speak it wherever you can to practice. Concentrate on conversation, pronunciation, vocabulary, and listening. If you can join some conversation classes, then that will really help you. If you need to learn or improve your English to pass an exam then you almost certainly need to attend classes. Self-study materials will help you, but you will also need special advice on preparing for your exam, and exam techniques. 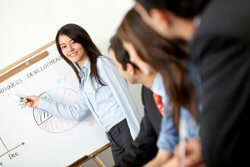 If you are studying English for work purposes then again a class would really help you learn. You will be able to role play particular situations such as telephone conversations, meetings, and presentations. If you study on your own you will not have an opportunity to do this. There is also some general advice that will help you learn English. If you study hard but never use English, then you will not improve. You will also never know if you understand it properly, as no one will be able to give you any feedback. Even if you are studying on your own, find a friend, colleague or classmate who you can practice with. Someone to correct your mistakes when you speak, or to look at a piece of writing for you, can make a huge difference to the rate at which you learn. SPEND AS MUCH TIME WITH ENGLISH SPEAKERS AS POSSIBLE! Even if you don't know any English speakers, watch English language movies, listen to English language radio, or read English language books, magazines, newspapers and websites. If you hear or read a new word, look it up in a good dictionary. These are the words you will remember. And try to use them as soon as you can after learning them. That way they will stay in your mind for longer.